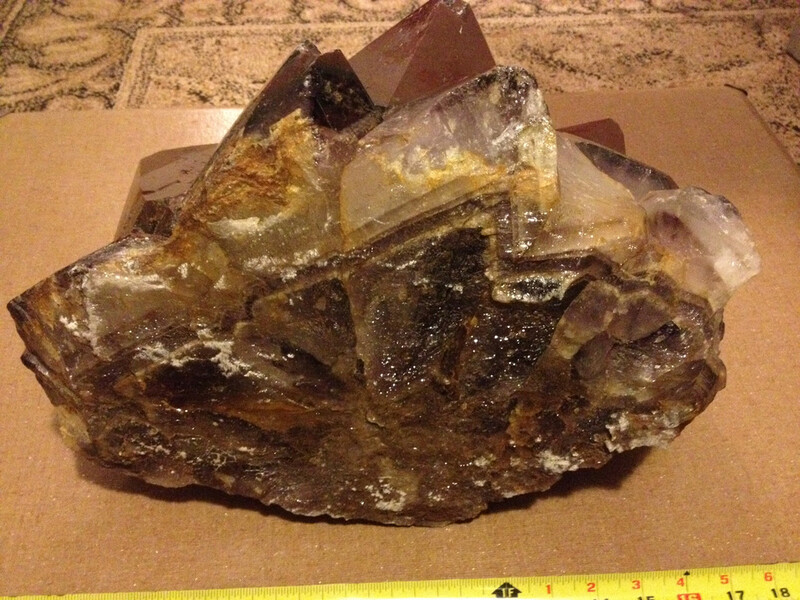 So found this huge crystal, at least im calling it a crystal, weighs 55 pounds just massive and heavy. Though it was amethyst but know nothing about rocks of any type. If you shine a flashlight through it it is purple but there is white as well, and what I would call dust suspended in it. Any help would be great, thanks. Definitely looks like a giant amethyst crystal cluster. And it looks like it has reddish-brown Hematite inclusions (which is perhaps the "dust" inclusions you are describing). Similar material exists in the Thunder Bay (Ontario) area Where did you find this monster? My buddys grandparents back yard guess they had it had been there for well over 50 years. We live in southern Ontario so Thunderbay would make sense. My friend wants to sell it he thinks its worth thousands, lol. I told him I doubt it. Its just so huge its crazy. Was it found there in the ground, or was it placed there by the grandparents as a nice ornament? Did you have to dig it out or was it just sitting there? Are there more? It it definitely worth money, and if there are more the deposit can be valuable. That almost looks like a Super 7 or Ametrine. Amazing! It's definitely worth money. Perhaps a museum would want it if they can work out the transport logistics considering it's size.